Battery Isolators - how long should they last? days now. Actually, I'm not even sure I'd know which thing under the hood WAS the isolator. as some have suggested, next time I have a dead chassis battery, to see if I can start the engine. or do they have a fairly finite functional lifespan? Would a GM/Chevy dealer know what to check? Ta in advance for any thoughts/suggestions/theories. Re: Battery Isolators - how long should they last? The isolator in my Roadtrek was the color red. It looked like a large heatsink with the cooling fins. They should last a long time but not forever. In my RT the chassis battery would be dead after 3 weeks of no use. Power locks, compass, radio all take a bit current. The "trunk" light is powered by the chassis battery. If your camping gear moved and knocked the switch into the on position it would drain the chassis battery overnight. I saw that pic of your isolator bridge, but I wasn't sure whether it was the RT or the R-Vision. I'll have a look under the hood near something with a pulley and belt. change in draw on the chassis battery. the mm as a bridge between the positive post and the cable end? Set at 20V? There shouldn't be any change in draw when the coach batteries are on, I'd think? also an LED bulb now, so it might take a bit longer to drain the chassis battery. You need to look for amp draw not voltage. Your multimeter might measure amps. If so, you disconnect the negative battery cable put the meter between the detached cable and the negative battery post with your meter on the amp setting. Some multimeters are only capable of measuring up to 500 milliamps and will burn out if you try to measure more. I wrecked one trying to measure parasitic draw. I my case the parasitic draw may have been 200 milliamps but the draw surges after you reestablish the the circuit. The vehicle computer uses more current for a minute or two when reconnected to the battery. I couldn't figure out how to connect up the multimeter and then disconnect the negative cable so that the circuit was not interrupted (I didn't have alligator clips, only had probes) so the initial surge wrecked my multimeter. I think it does measure amps. So, bridge between the negative cable and negative battery post using the mm on "amp"? Then enable the coach batteries switch and look for a drop in amperage at the chassis battery? Will it be a sizable drop or am I looking for milliamps, do you think? Or if there's any change at all in amperage, there's a problem? Here's another theoretical question. Do all the batteries on board share the same ground (the van's frame) and could that be the common denominator causing the draw down of the chassis battery with the coach batteries left on? I only have probes too. I'll give it a try. Maybe I can get my wife to help. Thinking about what you've suggested, do you think there's a way to determine if there's a problem at the isolator itself? Shouldn't there be zero change in the draw/amps on the chassis side of the isolator (assuming I can figure out which side that is) with engine off and the coach batteries enabled and disabled? I was just looking for an easier way to test this. The isolator posts might be easier to work with. Sorry for all the follow up questions, but I am clearly electrically challenged. So, bridge between the negative cable and negative battery post using the mm on "amp"? Yes, but I'd only do that if your multimeter can handle more than milliamps. If it has a 10A DC setting for example that's what I'd use. If the highest setting is 200ma dc I wouldn't use it just in case the current draw is higher. Then enable the coach batteries switch and look for a drop in amperage at the chassis battery? Measuring amps shows the amount of current used. I may have confused the issue a bit. You originally mentioned volts and you could do some testing that way. Voltage would drop if there's a load. For example, if the chassis battery measures 12.6V and the house battery measures 12.3V with the coach batteries switch off and then you turn the coach batteries switch on and you measure 12.6V at the house batteries then they are definitely drawing from the chassis battery. Not good if the motor is off. I did a similar test on the weekend. I started the motor, measured the voltage at the chassis battery, then measured the voltage at the house batteries to make sure the house batteries were being charged by the alternator. 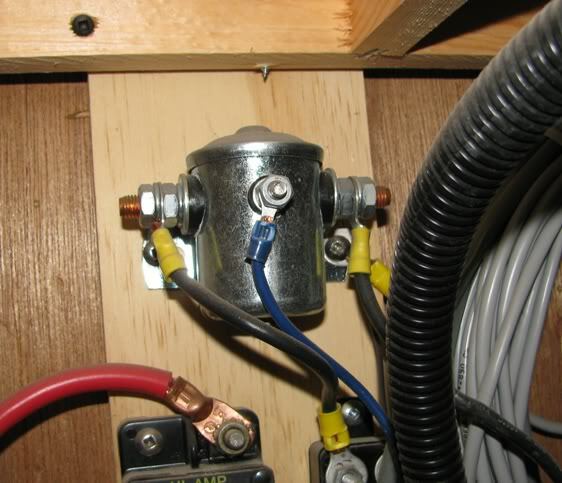 Often there will be a bit off a voltage drop due to cabling and the isolator. I measured 14.4V chassis battery and I think 14V at the house batteries. Good enough for me. I've wondered about this also - I just don't have the knowledge to be able to answer the question. Hopefully someone will answer it for us. First, I'd plug in the van and take voltage measurements on the chassis and house batteries. Basically, with an isolator, you want voltage to pass through the isolator only from the alternator (chassis battery) to the house batteries - not the other way around. When your van is plugged in you'll measure more than 13.5V at the house batteries. The chassis battery will read less than that. If the house batteries measure 14.4V and the chassis battery reads the same then they are not "isolated". That's either a faulty isolator or you have a "battery combiner" (it is better than an isolator). Second, I'd do the test that I did last weekend (mentioned above) to make sure the alternator is charging the house batteries. I mentioned the isolator in my Roadtrek was red. Often they are silver unpainted metal and cylindrical in shape with a post on either side and smaller post in the middle. A fully charged, rested battery won't measure more than 12.7V. My R-Vision (B+) had a battery combiner - the chassis battery got charged when the RV was plugged into grid power - sweet! It was mounted under the vehicle on the frame. My Bigfoot (Class C) has the silver cylindrical shaped isolator. It is located in the coach under the fridge. Thanks for all the ideas. I'll try them and see what I can find out. First, mission locate isolator/combiner. Those pics will help. Update: I found that RT electrical simulator online and, just for fun, emailed/contacted the author with my questions. He owns a 2002 RT 190V which I figured would be similar electrically to mine, and he helped me locate the isolator. service. It was not bypassed from what I could see and mine looks identical to the pictures you both posted/sent for me. CO detectors wake up and start to draw as well. 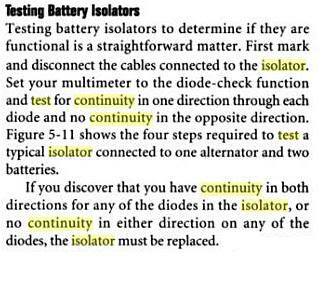 Theory (my theory): This should only draw down the Auxilliary batteries, if the isolator is functioning as designed. There should be no noticeable draw at the V-battery. must be surface charge present. Time to let it sit for a while. I actually was doing some other plumbing stuff with the RV and had the interior dome lights on and off as I opened and closed the doors. I did my first test yesterday after letting the V-battery rest for a while after an hour run around the town to charge it. The rest period was about 1 hour. So I measured 12.58 V on the V-batt with engine and ignition off and battery disconnect disabled/off. I tested the voltage several times over the next hour or so, and it actually crept up to 12.63V. Several more tests showed a steady 12.63V without any more ups or downs. I assume it is now fully charged, and any surface charge has dissipated. I then enabled the battery disconnect switch and measured every half hour for about the next 2 hours. The final test showed a V-batt voltage of 12.25V, which I would call a significant drop. get back to me with prices for replacing the isolator. 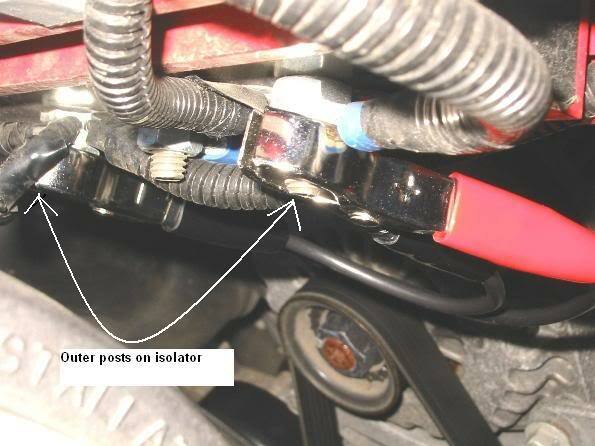 If anyone else has problems with their 2002 Chevy isolator, here's a couple of links John sent me. very much like the pic you posted up. Testing the isolator from Hehr .....(pdf file) very comprehensive. Just thought I'd ask about this first. I don't recall seeing something like that on my RT. It may have been repaired at some point or maybe the previous owner wanted a longer (or shorter) cord. If it looks reasonably well done I wouldn't be concerned about it. If you're getting the isolator replace maybe have the dealer take a quick look at it.